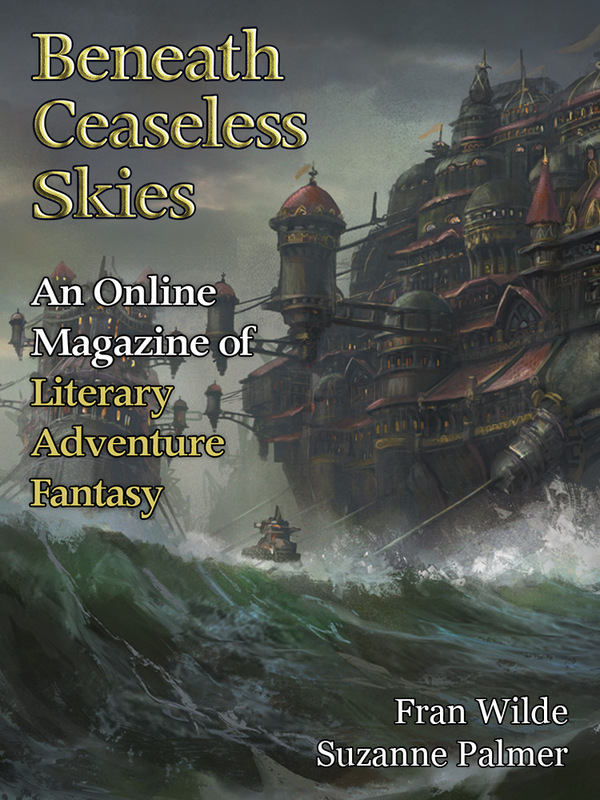 BCS #181 is out today, with two stories of overcoming obstacles, a guest-narrated podcast, and another giveaway for a newly released epic fantasy novel. Fran Wilde (“The Topaz Marquise” in BCS #152 and podast BCS 131) returns to BCS with “Bent the Wing, Dark the Cloud,” two family craftspeople fighting their nature in a cloud-top world. Suzanne Palmer offers “Moogh and the Great Trench Kraken,” about a simple man faced with surroundings and a challenge beyond his wildest experience. BCS #181 also features a special Author Interview with Fran Wilde, discussing “Bent the Wing, Dark the Cloud,” her previous BCS story “The Topaz Marquise,” and her brand new novel Updraft, set in the same world as “Bent the Wing, Dark the Cloud;” writing epic fantasy at short fiction and novel lengths, secondary-world settings, and more. The BCS Audio Fiction Podcast is BCS 157: Bent the Wing, Dark the Cloud. It’s guest-narrated by Folly Blaine, narrator of past BCS podcast episodes including and BCS 124: Golden Daughter, Stone Wife by Benjanun Sriduangkaew and BCS 146: Sun, Stone, Spear by Carrie Vaughn. In conjunction with “Bent the Wing, Dark the Cloud,” we’re also giving away a copy of Fran Wilde’s brand new novel Updraft, set in the same world as the story and featuring one of its characters. The giveaway is in this post. It ends ends Wed. Sept. 9, so enter soon!